According to the study, some coastal areas are going up by nearly one inch per year and if current trends continue, that number could accelerate to as much as two inches per year by 2025, explains Tim Dixon, professor of geophysics at the University of Miami Rosenstiel School of Marine and Atmospheric Science (RSMAS) and principal investigator of the study. "It's been known for several years that climate change is contributing to the melting of Greenland's ice sheet," Dixon says. "What's surprising, and a bit worrisome, is that the ice is melting so fast that we can actually see the land uplift in response," he says. "Even more surprising, the rise seems to be accelerating, implying that melting is accelerating." Dixon and his collaborators share their findings in a new study titled "Accelerating uplift in the North Atlantic region as an indicator of ice loss," The paper is now available as an advanced online publication, by Nature Geoscience. The idea behind the study is that if Greenland is losing its ice cover, the resulting loss of weight causes the rocky surface beneath to rise. The same process is affecting the islands of Iceland and Svalbard, which also have ice caps, explains Shimon Wdowinski, research associate professor in the University of Miami RSMAS, and co-author of the study. "During ice ages and in times of ice accumulation, the ice suppresses the land," Wdowinski says. "When the ice melts, the land rebounds upwards," he says. "Our study is consistent with a number of global warming indicators, confirming that ice melt and sea level rise are real and becoming significant." Using specialized global positioning system (GPS) receivers stationed on the rocky shores of Greenland, the scientists looked at data from 1995 onward. The raw GPS data were analyzed for high accuracy position information, as well as the vertical velocity and acceleration of each GPS site. The measurements are restricted to places where rock is exposed, limiting the study to coastal areas. 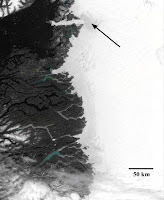 However, previous data indicate that ice in Greenland's interior is in approximate balance: yearly losses from ice melting and flowing toward the coast are balanced by new snow accumulation, which gradually turns to ice. Most ice loss occurs at the warmer coast, by melting and iceberg calving and where the GPS data are most sensitive to changes. 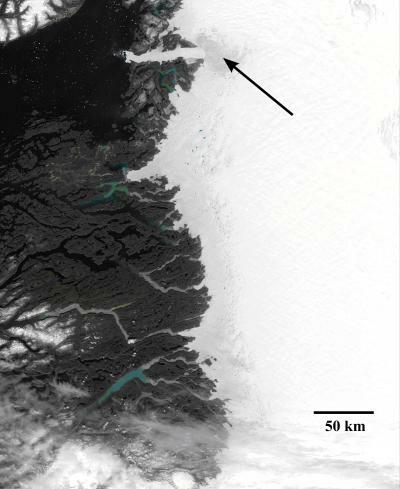 In western Greenland, the uplift seems to have started in the late 1990's. Melting of Greenland's ice contributes to global sea level rise. If the acceleration of uplift and the implied acceleration of melting continue, Greenland could soon become the largest contributor to global sea level rise, explains Yan Jiang, Ph.D. candidate at the University of Miami RSMAS and co-author of the study. "Greenland's ice melt is very important because it has a big impact on global sea level rise," Jiang says. "We hope that our work reaches the general public and that this information is considered by policy makers." This work was supported by the National Science Foundation and NASA. The team plans to continue its studies, looking at additional GPS stations in sensitive coastal areas, where ice loss is believed to be highest.